Bowling at Glasfryn Parc Ten Pin BowlingThe Glasfryn Parc Bowling Centre has eight bowling lanes, a fully licensed bar and dining room serving home-made meals. We are open from 10.00am seven days a week with food served until all day (most of the food on our menu is supplied by our very own farm and is available to buy in our Farm Shop). We have a very well stocked licensed bar and separate dining area. Tenpin bowling is a great activity for all ages. Our lanes are fully computerised and have bumpers and ramps for the younger children and those with disabilities, so everyone can play. We offer free shoe hire with all sizes being available. There is a wide selection of bowling balls to ensure all players can select the correct ball with weights ranging from 6 to 16 pounds and with different finger hole sizes so that players can select the perfect bowling ball. 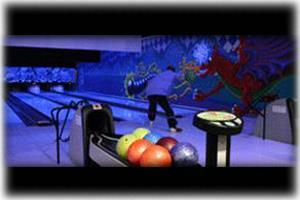 The Glasfryn Parc Bowling Centre has eight bowling lanes, a fully licensed bar and dining room serving home-made meals. Ramps & lane bumpers available for children. £5.00 per person for 1st game, £4.00 per person for 2nd game.